Dr. Oz is promoting a new two-day “Wonder Cleanse,” but it’s not like the popular cleanses you’ve heard of before. Instead of drinking nothing but water, lemon juice and cayenne pepper, you eat foods that naturally rid your body of toxins. That’s where the “cleanse” comes in. So think of it as more of a hiatus from ice cream and Funyuns and a shift toward pure foods. And why should we cleanse? According to Dr. Oz, our bodies are constantly being exposed to harmful substances in the environment and in our diet, and it’s important to flush those out so our bodies can get back to operating more efficiently. Think of it as a ‘spring cleaning’ of sorts for the body. Over the course of a 48-hour period, Dr. Oz encourages participants to eat six meals and eight snacks made from naturally-purifying, delicious ingredients. And the key? Enzymes. And the benefits, says Dr. Oz, are two-fold: physical and spiritual. 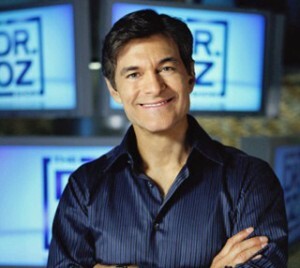 And per usual, Dr. Oz doesn’t leave you guessing what foods you can and can’t eat. He’s devised a specially-designed menu and snack plan that you can use as a guide over the course of your cleanse. Breakfast is quinoa with prunes: quinoa providing fiber, phosphorous and the ever-important nine essential amino acids. Lunch is a fruit smoothie with blueberries for antioxidants, bananas for vitamin B6, and flax or chia seeds for additional fiber. Dinner is vegetable broth with a side of sauerkraut and sliced apples, which is loaded with fiber, probiotics, and enzymes to support liver function and break down toxins. And a snack is pineapple and kale juice for even more digestive enzymes. In addition to a menu, Dr. Oz provides pointers to “make the most” of your cleanse, including tips like drinking plenty of water, not eating after 7 p.m., and getting 8 hours of sleep a night. If there was ever a cleanse to try, this may be it. But do so with caution. And as always, consult a doctor before starting if you have any special medical conditions. I constantly spent my half an hour to read this website's posts daily along with a cup of coffee. site. many userful things there, this time i'm a chunk obvious. I've bookmark your internet site. in touch more about your post on AOL? I require an expert in this house to resolve my problem. I became really pleased to land on this site. I would like to thank you for initiating this great article! saved as a specialty so I can keep up on your own unique quality. an email. I've got some creative ideas for your blog you might be interested in hearing. Either way, great site and I look forward to seeing it develop over time. definitely why I become like we need to do something about it. i read this article i thought i could also create comment due to this sensible piece of writing. automatically tweet my newest twitter updates. I've been looking for a plug-in like this for quite some time and was hoping maybe you would have some experience with something like this. Please let me know if you run into anything. I truly enjoy reading your blog and I look forward to your new updates. we really appreciate this article. I've been hunting everywhere for this! Appreciate goodness I found it on Bing. You have got made my personal day! Say thanks a ton again! cool and that i could suppose you're an expert in this subject. Fine together with your permission let me to grab your RSS feed to keep updated with drawing close post. Thank you one million and please keep up the gratifying work. now. (from what I've read) Is that what you are using on your blog? thing like that before. So great to find another person with some genuine thoughts on this topic. web site is one thing that is required on the internet, someone with a bit of originality! of information in such an ideal method of writing? I have a presentation next week, and I'm on the look for such info. Awesome article Evan, this renders total good sense. It's so funny how had been conditioned to become interesting to ladies whenever we want to win their approval and the reality of the mean is that's not enough, as I comprehend it, more importantly we need to be of interest to women. give it up on a platter and become a bit of a test she has to get the job done for. with you. Therefore there you choose, nuff replied. It's awesome to visit this site and reading the views of all friends regarding this paragraph, while I am also eager of getting experience. Supplements: Nutrition in a pill? How to tame your salt habit? Jennifer Aniston's Beauty Secret ! Jogging...The Secret of Long Life ! Does Gluten Make You Tired?